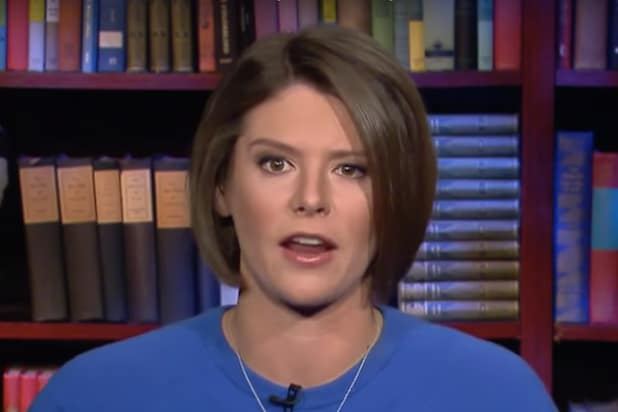 Donald Trump is no stranger to outlandish comparisons, but MSNBC’s Kasie Hunt came in for some mockery online after suggesting that the billionaire president’s hostility to the media was the most extreme since England’s King George III. Hunt made the remarks in a quote tweet in response to President Trump calling the media the “enemy of the people” during his Monday night rally in Columbia, S.C. Harsh words from the real estate magnate for sure — but perhaps not the harshest since the legendary British tyrant ruled over the 13 colonies during the mid-18th century. Many on Twitter were quick to point out that the comparison may have been overdone. Some, including Harvard law professor Adrian Vermeule, noted that when George III reigned over the American colonies there was no U.S. Constitution — let alone a First Amendment. Other critics, like the National Review’s Jonah Goldberg, pointed out earlier instances of presidents acting in less than noble ways toward American’s cherished First Amendment protections of free speech, a free press and the free exercise of religion. Which president weaponized the IRS against groups for practicing that specific Amendment? Just curious. Hmmm, do you think that the US presidents during the era of slavery believed in the first amendment? Did slaves have all those rights?